The first photo was taken on Saturday morning Sep 20, 7:20 AM using welding glass. The second around 8 AM same day. The third around 10:30. Wierd how all these flares look like the tail of a dragon,with the sun being the head. Flares can be identified when they appear in front of trees or other objects. But the flares reflect the bright objects in the photo, here the Sun plus Planet X personas on either side of the Sun, opposite each other. Note that the large pale green flares are reflections of the Sun and its halo, and the small white flares are reflections of Planet X, and that the degree of overlap in the flare, and relative position of the flares, echoes the overlap and position of the Sun and the Planet X persona. If at 4 o'clock as in the first photo, at 4 o'clock in the flare. If at 10 o'clock in the photo, then at 10 o'clock in the flare. 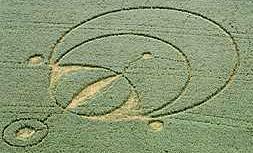 Note that the 4 o'clock and 10 o'clock positions are on either side of where the Ecliptic dissects the Sun, personas bounding the sides similar to what has been presented in the Aug 24 Ohio Lotus Flower crop circle.